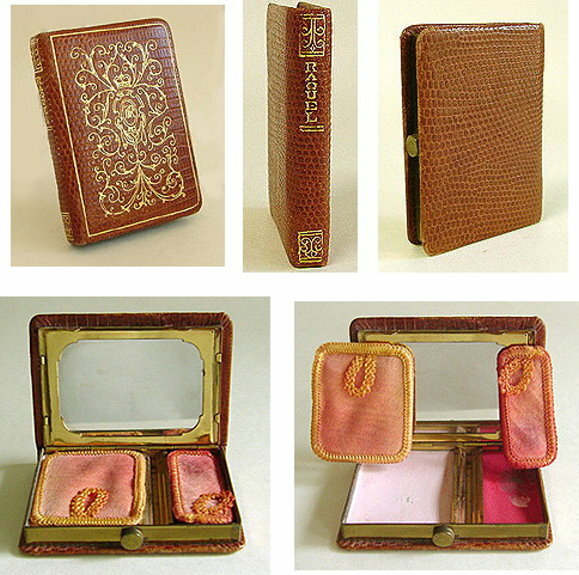 Tan leather with gold stamped lid of rococo design. Polished metal mirror. Puff for pressed powder compartment. Leather in excellent condition - very slight wear to corners - hard to find in this condition. Size: 2 3/16" x 3." Condition: Excellent. Large area of rouge used down to base. Small area of powder used down to base. The lid on this compact is shiny deep red enamel (the enameling in the photo may appear to be faded -- it's just camera reflection). The polished flowers are accented with one amber-colored stone in the center. The white fabric puff, with plush back, has a white ribbon stamped in gold "FIFTH Rex AVENUE." Beveled mirror. Powder screen. Bottom has a ribbed pattern giving it a polished look. 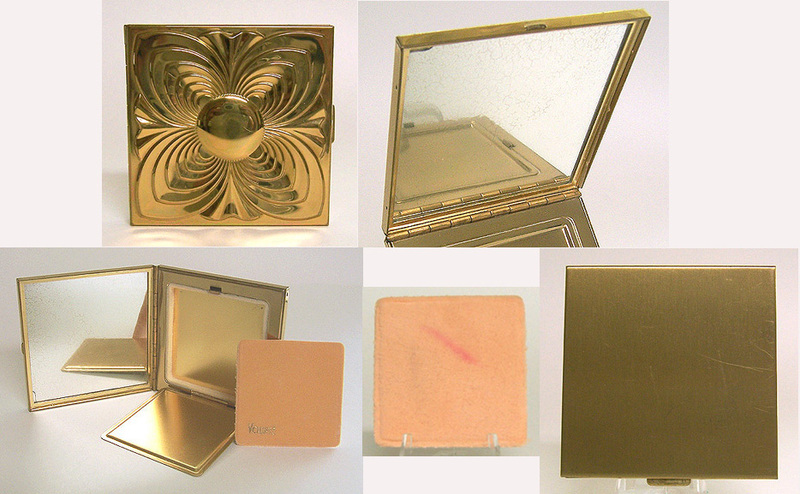 The lid on this gold-tone metal compact is highly polished. It is embossed with a deco-style flower with convex center and concentric petals. The puff and lid to the powder compartment are signed. Framed mirror. Matte finish on back of case. Size: 3" square. Condition: Case, excellent -- no dents, normal age wear on back. Mirror, good -- tiny crack upper left corner, slightly cloudy (looks worse in photo), no loss of silver. Puff has mark on plush side. See additional photos. 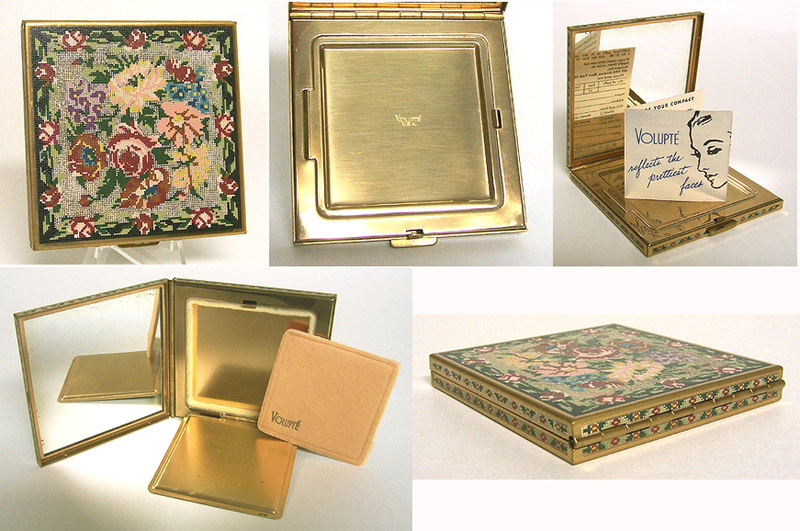 This compact features an enameled faux petit point design on the lid, back, and all sides. The lid and back have the same design. Framed mirror. Powder compartment lid and puff are signed. Original printed material (in powder compartment) on care and reordering additional puffs. Size: 2 15/16" square. Condition: Case enameling -- very good. Mirror, very good -- slight discoloration around 3 edges, otherwise clear. Puff -- mint. See additional photos. 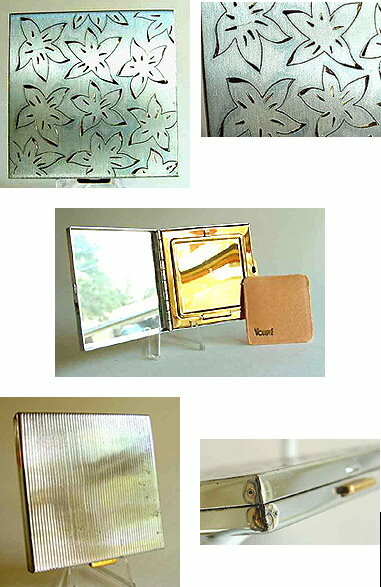 This compact was made by Volupte. The lid and back of the case are striated. The lid features a domed rhinestone closure bar (4 rows of stones). The puff and lid to the powder compartment are signed. Case-glued bevel mirror. Printed material (in powder compartment) on care and reordering additional puffs. 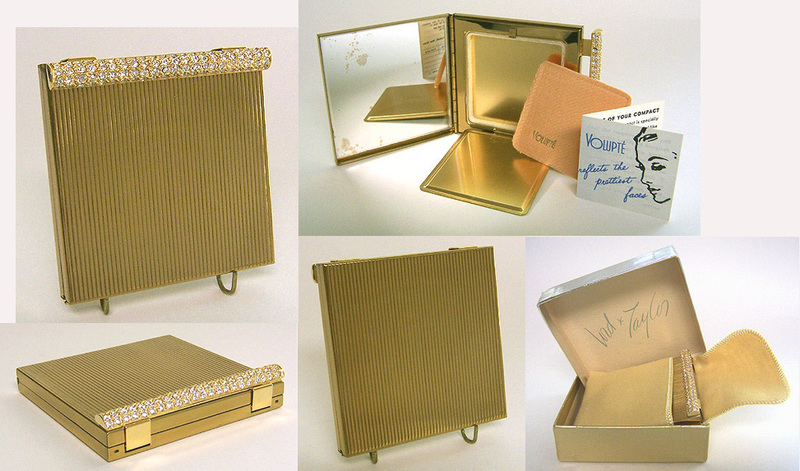 Comes with its original gold-colored felt pouch -- and -- as found, silver and gold gift box from Lord & Taylor! Size: 3" square. Condition: Case, puff and pouch -- pristine (appears to have never been used). Mirror, very good -- some spotting, otherwise very clear. See additional photos. The case is silver-colored metal with textured finish and depicts a court lady with flowers. Mirror in excellent condition. Signed "Norida" over the mirror. Interior has sifter for powder. Back of case is signed and has a depressed thumb nail area to facilitate opening. Size: 2" diameter. Condition: Shows wear, but very good for its age. Discoloration on back. No puff. The case is metal. The lid has a decorative silver band around the edge, over a white satin center with heavily applied pearlized paint resembling shells. Delicate gold accents around painted areas with applied bronzy-gold sparkles. 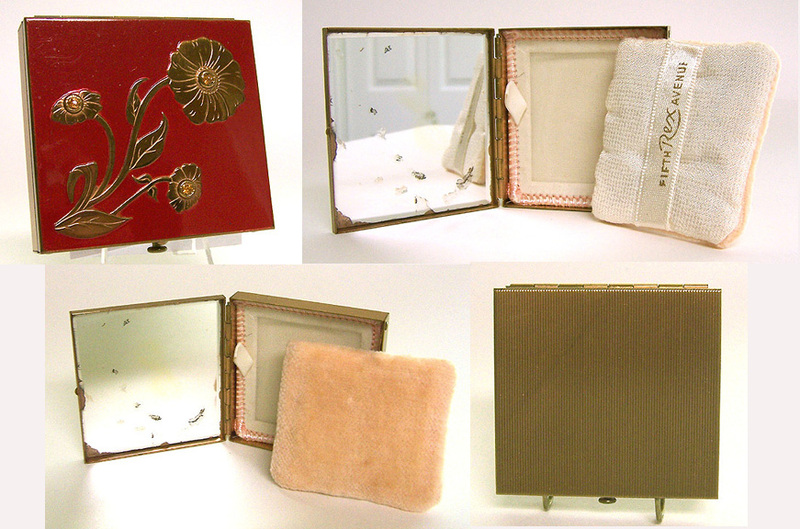 Mirror in good condition; powder screen in mint condition. Signed puff, not readable (possibly Wadsworth or Woodworth) in very good condition. Back of case is brushed gold. Dates from late 1930s to early 1940s. Size: 2 1/4" x 1 3/4." Condition: Overall, very good. Mirror has minor silver loss to some areas around the edge. Back of case has one very tiny nick (not a dent). Silver metal exterior with gold metal interior. Stylized flowers on lid are etched-to-gold. This compact was never used. Beveled mirror is in mint condition. Gold interior in mint condition. Signed puff. Ribbed back in good condition. Possibly 1940s to early 1950s. Size: 2 7/8" square. Condition: Very good. Some light lacquer discoloration around the petals. Minor spotting on back. Factory defect on left corner (see pic) does not detract. Mini Volupte compact with stones. Silver-toned metal with ruby and clear stones simulating hinges and clasp. The red stones are much brighter than photos show. No missing stones. Framed mirror, no chips or cracks. Signed puff shows little wear. Probably 1930s or 1940s. Size: 1 7/8" square. Condition: Overall, excellent. Some light scratches on lid and back; tiny nick on lid. Light shading on mirror. Truly a work of art. Ecru-colored Belgian lace backed with ecru satin. Sticks and guards are genuine mother-of-pearl - no breaks or cracks. Brass loop is securely attached with a mother-of-pearl cap on both sides. 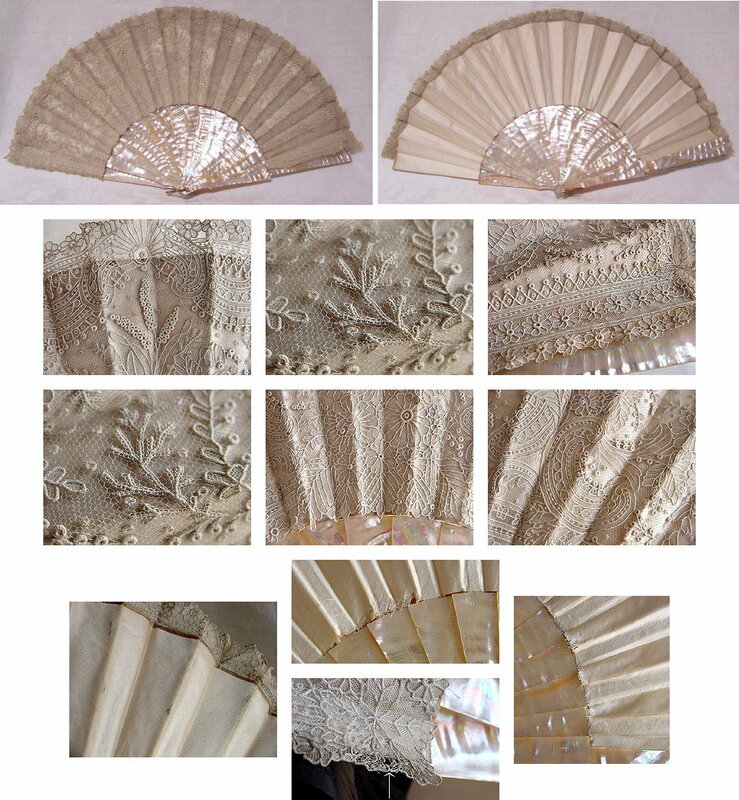 See the close-up pictures showing the beautiful and skillful lacework. Size: 21 1/2" x 11." Condition: Overall -- excellent for age. Front - 1 small spot, in center, on fold; 1 tiny pinhole in lace near bottom corner edge of left guard. Back - 3 lightly soiled areas not visible on front; minor fraying 2 areas along sticks; tiny surface chip on m.o.p. This wonderful tin once held Yankee Clover dusting powder but is now empty. Colors are sharp (brighter than the pictures show). The background color is salmon. 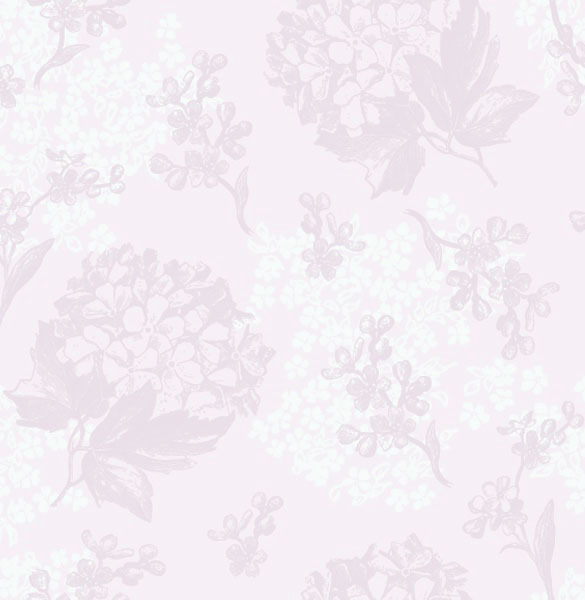 There are four groups of flowers around the sides. The printing in the bottom is very sharp, no signs of wear. Size: 4" diameter x 2 7/8" high. Condition: Overall very good condition. One small dent near the bottom rim. Silver on outer edge of the cover is discolored, but does not detract. This blue and light turquoise-colored pottery powder box was made by Ramses, a French company. This is the same company that made rare Egyptian-styled perfume bottles in the 1920s. It is very deco in style with a lady sitting on the cover. The box and cover are flat on the back with chamfered corners on the front – both pieces are highly glazed inside and out. The bottom of the box is also glazed and is impressed "Ramses, Germany." Size: 5 3/4" h. (to top of lady’s head) x 3 1/2" w. (at back of base). Condition: This lovely deco box met with an unfortunate accident being transported to a show. There is a single break in the neck/shoulder area which has been glued. The most visible damage is on the back side. The greatly magnified pictures make the damage appear a lot worse than it actually is -- damage is barely noticable from the front. This lady is looking for someone to love her the way she is. Still a wonderful deco box. See additional photos. This lovely glass jar was produced by Jean-Charles Brosseau for “Ombre Bleue” dusting powder. It is empty. It is frosted and molded with flowers and vines. The cover is white bakelite -- stamped in gold lettering with the fragrance and maker’s names. 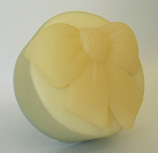 There is also a, molded, gold plastic inner cover, with the fragrance name, that sets down over the opening of the jar. The bottom of the jar is marked in raised lettering with the fragrance and maker’s names – also -- “Made in France for Alfin Inc, 200 grs.” This is a very heavy piece – weighs a little more than 3/4 lb. (14 oz.)! Size: 3 1/2” diameter x 2 1/2” high. Condition: Very good. Glass -- no chips or cracks. Bakelite cover – no cracks, very small chip on bottom edge of side; almost all gilded lettering has flaked off, but there is an undercolor of printing that is beige in color -- very readable). 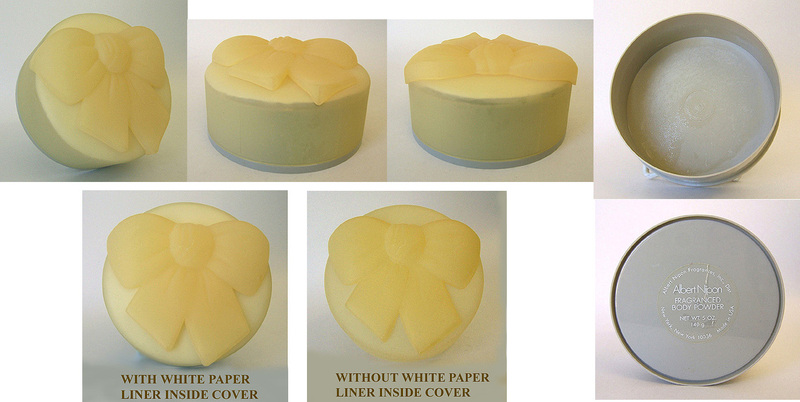 Inner plastic cover – no cracks, slight wear to gold. Overall – a lovely piece and rarely seen. See additional photos. Size: 5 3/8” diameter x 3” high (at highest point). Condition: Excellent – no chips or cracks to cover or bottom. Interior of box bottom has what appears to be glue residue -- probably from the paper box that contained the powder. Decal label – excellent. See additional photos. This vintage box of face powder was made by Yardley and fragranced with, Old English Lavender. The powder color name is Natural. The interior cellophane has been torn open on the top edge but is all there. Still retains about 50% of its original powder. Bottom label. Size: 3 1/8" diameter x 1 3/8." Condition: The box is in good condition with some minor rubbing on the side edge. Exterior: The entire exterior of this extraordinary purse is covered with the tiniest pearlized ivory-colored glass beads. There are approximately 13 hand-sewn beads per running centimeter or 32 beads per running inch (see close-up photo and count the beads!). Backing for beading is very fine ecru lace. Interior: Lining is ivory satin. Interior frame is unmarked - may be silver plate - shows tarnishing - have not tried to clean it. Open pocket on one side. Snap-closure coin purse (4 1/4" w. at top) attached on sides to main framework by metal pegs allowing it to swing back and forth (see photo). Fabric discolored from metal pegs in those areas, but not worn. Frame of coin purse is covered with satin - no signs of wear. Bottom of coin purse is sewn into bottom seam of lining and creates a compartment on each side of the purse. Coin purse has unique angular separation (see photo) creating two compartments within it! Interior of coin purse stamped in gold letters, MADE IN FRANCE. Size: 6 1/4" w. at top frame x 6 1/2" at bottom x 5 1/2" l. Condition: Overall -- excellent for age. Exterior: No missing or loose beads. Repair patch on back right corner (see photo) -- professionally restored years ago - expertly done and definitely does not detract from the beauty of this piece, especially since it's on the back side (see close-up photo). Interior: Some spotting on satin lining but no big stains, tears or holes in fabric. Cameo Closure: Faux nacre on a couple of pearls is worn off. Metal post that passes through interior clasp appears to be coming out. However, purse closes very securely - have not attempted to reinsert it as it may affect the closing.